With Chrome dominating the desktop browser space, it’s easy to forget that there are alternatives out there. One of the oldest is Opera, and today the company behind that browser has announced a new version as being available. Opera 43 is claimed to be the fastest version ever, and it brings a few new features to achieve that title. First, instant page loading predicts which URL you’re typing in the address bar before you’ve finished typing it, and proceeds to load that website in the background. So when you do actually hit enter to go there, it will appear to load instantly. 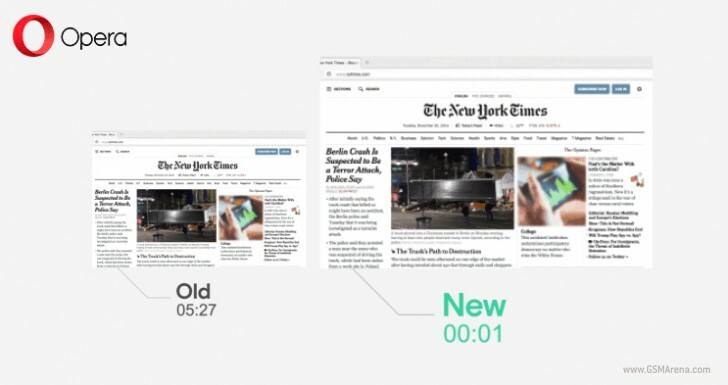 Instant page loading gets smarter with time, learning from your habits. What’s more, when you use the address bar to search for something it pre-loads the results most likely to be clicked. On Windows, there’s a different performance feature built into the latest version of Opera too. It’s called Profile Guided Optimization (PGO), and it’s a compiler technique that can make software running on Windows significantly faster, while using less CPU. PGO optimizes the most important parts of the browser, making its startup around 13% faster than before. Benchmarks confirm that the browser engine has received a performance boost too, with improvements of 3.35% to 60.3% depending on which benchmark you run. Finally, Opera 43 has “classic link selection”, meaning that you’re able to quickly and easily select text in a link without triggering the link. This is made possible by a change in the click and drag functionality. You now use horizontal click and drag to select text, and vertical click and drag if you want to drag a link. Before, no matter the direction, the link would be dragged, thus making text selection inside it pretty difficult.